Blood Agar (BA) are enriched medium used to culture those bacteria or microbes that do not grow easily. Such bacteria are called “fastidious” as they demand a special, enriched nutritional environment as compared to the routine bacteria. Blood Agar is used to grow a wide range of pathogens particularly those that are more difficult to grow such as Haemophilus influenzae, Streptococcus pneumoniae and Neisseria species. It is also required to detect and differentiate haemolytic bacteria, especially Streptococcus species. It is also a differential media in allowing the detection of hemolysis (destroying the RBC) by cytolytic toxins secreted by some bacteria, such as certain strains of Bacillus, Streptococcus, Enterococcus, Staphylococcus, and Aerococcus. Blood agar can be made selective for certain pathogens by the addition of antibiotics, chemicals or dyes. Examples includes crystal violet blood agar to select Streptococcus pyogens from throat swabs, and kanamycin or neomycin blood agar to select anaerobes from pus. Suspend 28 g of nutrient agar powder in 1 litre of distilled water. Heat this mixture while stirring to fully dissolve all components. Autoclave the dissolved mixture at 121 degrees Celsius for 15 minutes. Once the nutrient agar has been autoclaved, allow it to cool but not solidify. When the agar has cooled to 45-50 °C, Add 5% (vol/vol) sterile defibrinated blood that has been warmed to room temperature and mix gently but well. Dispense into sterile plates while liquid. 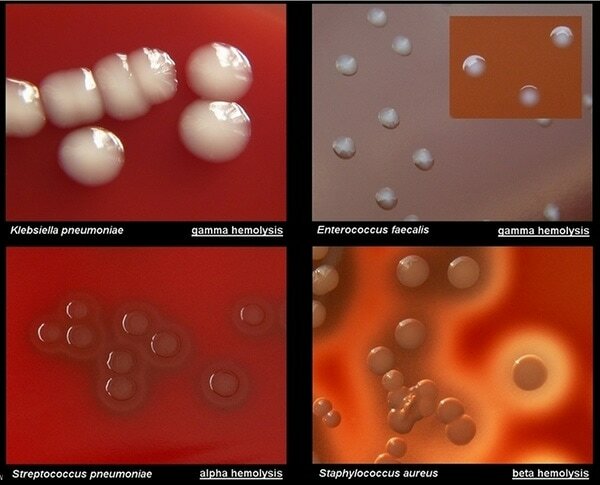 To differentiate bacteria based on their hemolytic properties (β-hemolysis, α-hemolysis and γ-hemolysis (or non-hemolytic)). Read more about Haemolysis and its types. how do you prepare kanamycin blood agar. i needed some reference article for the same. can we use human blood instead of sheep blood for media preparation?? does it make any change?? Hi! Is it necessary to incubate blood agar inuculated media in a candle jar? I am worried that your information on the type of organisms that grow on BAP (blood agar plates)might have come from a source that has very little experience in microbiology. The only time I have observed Haemophilus influenzae growing on BAP is when it is sateliting around a Staph.aureus colony. BAP alone does not support the growth of H.influenzae. Barbara, can you send some photos then?